Cupola roofs with options of Copper or Aluminum. Tower and base from Wood, Aluminum, PVC or Vinyl. Towers are available with louvers or glass windows. Custom quotes are welcome. Sizing of Cupolas: Use 1-1/4" inches of cupola for every foot of unbroken roof-line. For 2 or 3 cupolas use 1-1/2" and for 4 or more cupolas use 1-3/4" of cupola for every foot of unbroken roof line. Cedar Tower (louvers or glass) and Base. Copper or Aluminum Roofs. Beautiful and functional. PVC Cupolas available with Louver or Glass Towers. 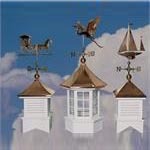 All cupolas available with Aluminum or Copper Roofs. Louver or Glass Towers: Base and tower constructed from white PVC Vinyl. Copper Roof with a 10/12 pitch is standard. Nothing can compare with the quality and convenience of a made-to-order prefabricated Aluminum Cupola. Choose from our 78 standard models or let us build a custom cupola to your exact specifications! Weathervanes are optional. 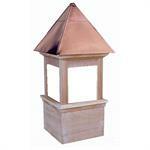 PVC coated Aluminum Glass Octagon Cupola with Copper Bell Roof. 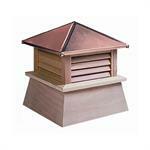 White PVC coated Aluminum Louvered Cupola with copper roof. The Bedford Cupola has an octagon base with a bell style roof. White PVC coated Aluminum Louvered Cupola with copper roof. The Charleston Cupola has a square base with a bell style roof. White PVC coated Aluminum Louvered Cupola with copper roof. The Estate Cupola is a hexagon with a hip style roof. White PVC coated Aluminum Louvered Cupola with copper roof. The Georgetown Cupola has an octagon base with a hip style roof. White PVC coated Aluminum Louvered Cupola with copper roof. The Jamestown Cupola has a square base with a pagoda style roof. White PVC coated Aluminum Glass Octagon Cupola with Copper Hip Roof. White PVC coated Aluminum Louvered Cupola with copper roof. 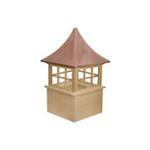 The Madison Cupola has a hexagon base with a pagoda style roof. White PVC coated Aluminum Glass Cupola. The Nantucket Cupola has a hexagon base with a hip style roof. White PVC coated Aluminum Glass Octagon Cupola with Copper Pagoda Roof. White PVC coated Aluminum Louvered Cupola with copper roof. 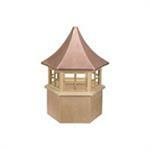 The Providence Cupola has an octagon base with a pagoda style roof. White PVC coated Aluminum Louvered Cupola with copper roof. The Richmond Cupola has a hexagon base with a bell style roof. White PVC coated Aluminum Louvered Cupola with copper roof. The Stansbury Cupola has square base with a hip style roof. 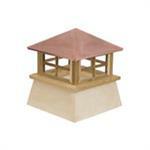 White PVC coated Aluminum Glass Square Cupola with Copper Pagoda Roof. White PVC coated Aluminum Glass Square Cupola. The Vermont Cupola has a square base with a bell style roof. White PVC coated Aluminum Glass Square Cupola with Copper Hip Roof. White PVC coated Aluminum Glass Hexagon Cupola with Copper Bell Roof. 21-1/4" x 25" (Roof Width x Overall Height) Suggested for buildings Up to 22' Long. For Max Roof Pitch 8/12. 24-1/4" x 26" (Roof Width x Overall Height). Max. Roof Pitch 7/12. Suggested for buildings 15 - 25' Long. 27" x 31" (Roof Width x Overall Height). Roof Pitch up to 8/12. Suggested for buildings 20 - 35' Long. 34-1/2" x 33" (Roof Width x Overall Height). Maximum Roof Pitch 7/12. Suggested for buildings 30 - 45' Long. 40-1/2" x 40" (Roof Width x Overall Height). Maximum Roof Pitch 8/12. Suggested for buildings 40 - 55' Long. 46-1/2" x 42" (Roof Width x Overall Height). Maximum Roof Pitch 7/12. Suggested for buildings 50' & longer. Available in sizes ranging from 12"w to 127" overall height. Optional Grilles on interior of glass. Available in sizes from 14"w to 196" height. 27" x 60" (Roof Width x Overall Height). Roof Pitch 14/12. Suggested for buildings 20 to 35' long. Optional Grilles on interior of glass. Available in sizes from 12"w to 180" height. 30-1/4" x 75" (Roof Width x Overall Height) Roof Pitch up to 20/12. Suggested for buildings 35' to 50' long. Optional Grilles on interior of glass. Available in sizes from 24"w to 230" height.